Marks elements for refinement or coarsening based on the fraction of the min/max error from the supplied indicator. The elements are sorted by increasing error. The elements comprising the "refine" fraction, from highest error to lowest, of the total error are marked for refinement. 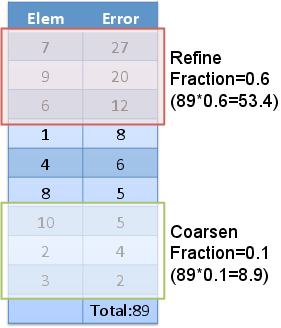 The elements comprising the "coarsen" fraction, from lowest error to highest, of the total error are marked for refinement. indicatorThe name of the Indicator that this Marker uses. Description:The name of the Indicator that this Marker uses. coarsen0Elements within this percentage of the min error will be coarsened. Must be between 0 and 1! Description:Elements within this percentage of the min error will be coarsened. Must be between 0 and 1! clear_extremesTrueWhether or not to clear the extremes during each error calculation. Changing this to `false` will result in the global extremes ever encountered during the run to be used as the min and max error. Description:Whether or not to clear the extremes during each error calculation. Changing this to `false` will result in the global extremes ever encountered during the run to be used as the min and max error. refine0Elements within this percentage of the max error will be refined. Must be between 0 and 1! Description:Elements within this percentage of the max error will be refined. Must be between 0 and 1!